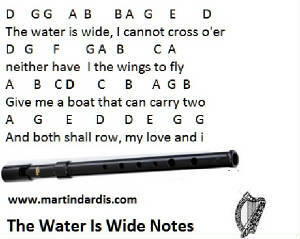 The Water Is Wide Lyrics And Chords A traditional song from the eighteenth century, recorded by Liam Clancy and James Taylorthe . Sheet music included along with the tin whistle notes. And both[A7] shall roam,my[D] love and I. In the letter notes below the D in the third line is a high note.